You don’t build Rome in a day – the same can be said for The Canturbury job. We love taking on challenging projects because it gives us an opportunity to get back to the things that we love most: teamwork and project management. Since the beginning of our company over 30 years ago, we’ve loved getting our hands dirty and working in the field with our crews. Every stage of this project required our team to carefully evaluate each step of the installation. Do we have your curiosity yet? If so, let’s dive in together to see what all this job entailed! Our Earth is comprised of lands that rise and fall. The soil beneath us constantly expands and contracts due to temperature changes, ground moisture, tectonic plates and soil composition. Because of these natural elements, our backyards are all created different, not equal. Anytime a new deal is struck and we begin our work – we have to capture the elevations of your backyard. This job had a sloping yard that sloped downwards towards the fence line – away from the house. To elevate the yard, we brought in 10 truckloads of dirt & built a retaining wall to fill the void. Not exactly the type of work you would expect from a pool builder! Well, like any home contractor, we believe the foundation is the most important part of any project. It determines how our pool will settle over time and prevents long-term issues that are common in lots of swimming pools. 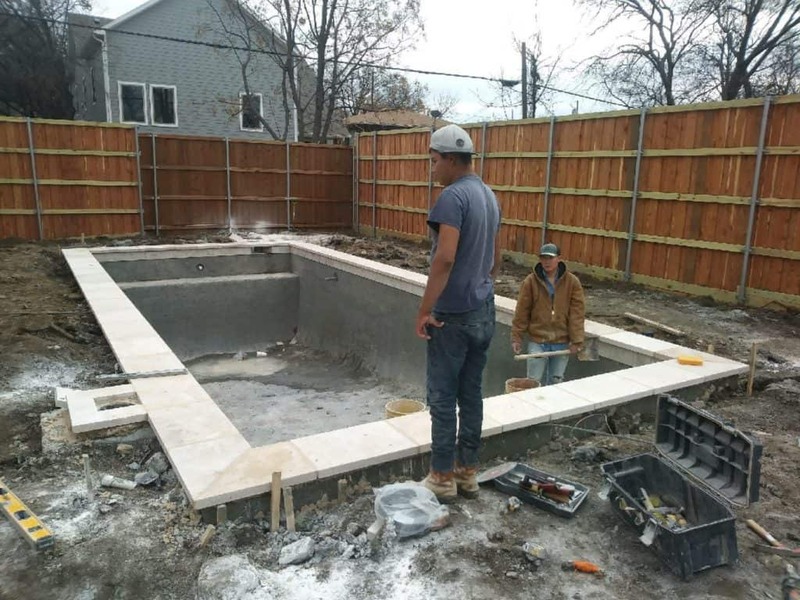 We take the additional time necessary to prevent these issues and it’s one key element that separates our pool construction technique from other pool builders. Patios are a beautiful thing and they provide great spaces for our families to connect. This homeowner already had a preexisting patio that they wanted to keep intact. For that reason, we needed to add on to their existing structure and not remove what already existed. We had to work delicately to ensure we did not harm the existing decking during any stage of the project. Friction Loss sounds like a science terminology or something that you hear in a body shop; surely swimming pools don’t have friction! I mean it’s water, right? Well, believe it or not – water creates a tremendous amount of friction as it is pushed through your pool plumbing. All of this friction creates back pressure on the pump and can lead to lower flow levels out of the water features. To keep the pool equipment away from the patio and pool, we placed it 80 feet away from the pool. It reduces the noise of the equipment but increases the friction within our system. Every PVC Fitting, such as a 90^, 45^ or reducer fitting adds additional friction. We calculated all of this estimated friction to size our equipment and plumbing correctly. The result: some beautiful and equal water spouts that are well balanced and gentle. To compensate for added friction loss, we increased our plumbing size and run our water features on a separate pump. This allows for greater water flow and increased efficiency throughout the entire system. Like we said, you don’t build Rome in a day. This project took us 14 weeks to complete from breaking ground to turning over the keys. Mark McCaffrey was the superintendent & designer. There’s a lot to consider when building a beautiful swimming pool, but we take on projects like these every day. It takes a strong team and a larger investment to build a pool the Summerhill way but it’s the only way we know. We love waking up every day to build intricate swimming pools and we are glad that you are here on this journey with us!